On Election Day, residents in the Oxford area will be determining the outcome of four different races for seats on the Oxford School Board. In the at-large race, Donna Arrowood is competing against first-time candidate Kristen Dean. Arrowood previously served for four years on the school board and is now seeking a second, non-consecutive term. Residents all across the school district will be voting in the at-large contest. In Region I, which is comprised of Upper Oxford Township, Lower Oxford Township East, and Oxford Borough East, the two candidates for one seat are Eric Owens and David Severino. In Region II, which includes West Nottingham Township, Lower Oxford Township West, and Oxford Borough West, incumbent Steve Gaspar is the only candidate on the ballot. In Oxford’s Region III, which includes East Nottingham Township and Elk Township, candidates Jenifer Warren and Charley Moore are vying for the one open seat. With three current school board members choosing not to seek re-election, there will be at least two first-time school board members when the board reorganizes during the first week in December. Arrowood has extremely deep roots in the Oxford community. She is a lifelong Oxford resident and a graduate of Oxford Area High School. Her mother also graduated from the school. Her brother was a longtime chemistry teacher in Oxford schools, and Arrowood herself retired from the school district after working for the better part of 30 years in the administration building in a variety of roles, ranging from tax collector to accounts payable employee to administrative assistant to the business manager. “I am truly committed to the school district,” said Arrowood. When Arrowood previously served as a school board member for four years, two of them as board president, the board hired the administrative team of superintendent David Woods and assistant superintendent Dr. Margaret Billings-Jones. They still lead the district today. Arrowood is also proud of the fact that the school board negotiated a teachers’ contract that was fair to teachers and taxpayers alike. Keeping property taxes as low as possible for residents is a priority. “We always have to be fiscally responsible,” Arrowood said, explaining that she continues to serve on the district’s Budget and Finance Committee. She understands very well the budgetary constraints that the district faces, and the items that impact the budget. The current school board has already entered into negotiations on a new teachers’ pact. If Arrowood were elected to the school board, she would have an understanding of how the terms of the contract could impact the district. She said that she wants the district to have a contract in place that will allow Oxford to keep its teachers and administrators, but will also be fair to the taxpayers in the community. Arrowood likes the relationships that the Oxford Area School District has formed with Delaware County Community College and Cecil College that give high school students the opportunity to earn college credits while they are still in high school. She would like to see a similar agreement with Lincoln University that would allow Oxford students to take courses there, too. Arrowood, who still has a grandson in the Oxford schools, believes that her previous experience on the school board, and her dedication to the school district would be assets to the next school board. According to Eric Owens, his priorities if he were elected to the Oxford School Board would be to always make decisions that put the needs of the children first. “Children must be our first priority,” he wrote in an email. “As a parent and a resident of Oxford, it is my belief that we owe it to our students, and to our community, to always prioritize the young people of our district. Before making any decision, the OASD board must first ask, 'What is the impact on our students?'" Owens, who has lived in the district since 2011, holds a PhD in counselor education and supervision from Duquesne University. He also earned a certificate in secondary school counseling from Duquesne University. He teaches in the College of Education at West Chester University, focusing on college and graduate school classes on school funding and how politics can impact education. He also previously worked as a guidance counselor. He has worked with the General Assembly in Harrisburg on issues related to education across Pennsylvania, specifically in rural areas like Oxford. As a Department Chair at West Chester, is responsible for managing a substantial budget, ensuring taxpayer dollars are used effectively. Owens is an expert in crisis intervention and school crisis prevention, and he also has experience securing grants, training educators, and advising schools, including both public, private, and charter schools. He said that if he were elected to the school board, accountability would be a priority for him. Jenifer Warren, a candidate for the Oxford School Board in Region III, said that her decision to seek a seat was about ten years in the making. 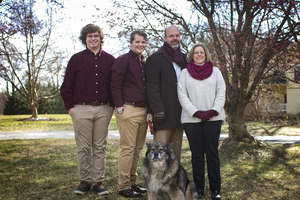 She was first asked to run for the school board ten years ago, but the timing was not right then—she and her husband, Kevin, had young children and her husband had just started a new engineering business. Now, the children are older and the business is established, and Warren is ready to take on the challenge of serving on the school board. “I feel like I can dedicate the time necessary to do the job that the taxpayers and the residents deserve,” she said. Warren grew up in Lower Delaware in a small town that is similar to Oxford. Her parents owned a country store where she worked through high school and college. Because she went to a school in a community similar to Oxford, she has an understanding of the demands placed on a school district to meet the needs of a diverse student population. After she graduated from high school, she went back to her high school principal to talk about how students were being prepared. The principal told her something that she remembers to this day. Warren wants Oxford to strive to ensure that every student is prepared for whatever they choose to do after high school, whether it's attending a four-year university, a two-year program, serving in the military, or entering the workforce right away. Warren earned a bachelor of arts degree from the University of Delaware and a masters of Library and Information Science at SJSU. She went on to work in both public and school libraries. When she and her husband started a family, they moved back to this area because they wanted their children to be raised in a small-town environment. They have lived in Oxford for 14 years, and currently have two children in the Oxford schools. “I'm very happy with the education that they have received,” Warren said. In addition to raising children, Warren spent time helping with her husband's business, and has been volunteering at local food pantries. She writes a blog about people experiencing food insecurities to raise awareness about the issue. She has been a volunteer in the Oxford schools, and also served on a district Strategic Plan Steering Committee. When she's been out meeting with residents, Warren said that concerns about high property taxes have been the issue mentioned more than anything else. “Taxes have come up more than anything, and that hasn't surprised me,” Warren said. She said that she would like to the see the school district do a better job of providing budgetary information to residents. Earlier this year, the district sent out pie charts of some of the budgetary information was a good start, and she would like to see more of that. She would also like to see the district communicate more about the quality education that students are receiving. More information is available about Warren's candidacy at www.Warren4oasd.org.